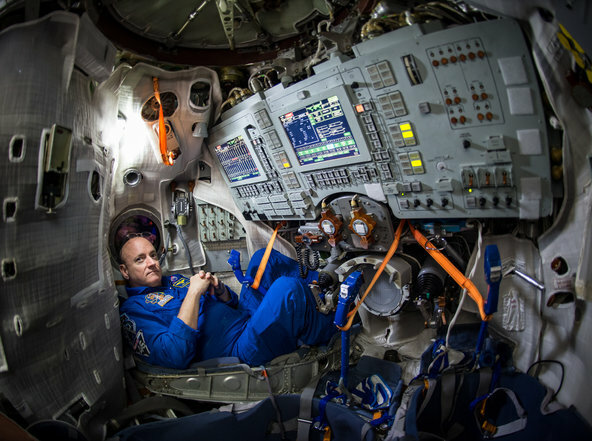 Today, at 3:42 PM, NASA astronaut Scott Kelly will launch into space in an attempt to become the first American astronaut to spend 1-year straight in the vast unknown. He will not be alone, though. Next to Kelly will be Russian astronauts Mikhail Kornienko and Gennady Padalka (who with this trip will break the record for the most cumulative time spent in space). For this mission, the trio will ride out on the Soyuz spacecraft, which is now making its 16th official launching with astronauts on board– including a trip back in 2010 that featured Kelly. The astronauts will be headed to the International Space Station (which is roughly 250 miles above the earth) where they will meet up with three other crew members– United States astronaut Terry Virts, Russian cosmonaut Anton Shkaplerov, and Italian astronaut Samantha Cristoforetti. While there, NASA plans to study the effects of long-term spaceflights on the human condition to help plan later trips to Mars. If you want to check out the launch and stay updated with all of the details, then make sure you click over to The New York Times continuous coverage. You’re not going to want to miss it! This entry was posted in Culture and tagged international space station, launch, NASA, record, scott kelly. Bookmark the permalink. Is the Lincoln Continental Gearing Up for a Comeback? ?